With eight stunning Royal Parks, around 110 square kilometres of parkland and gardens with over six million trees, London is one of the greenest capital cities in the world. Only 30 minutes or so from central London, this is English countryside as you might imagine it depicted in a glossily illustrated Robin Hood story: mighty oaks, a thousand years old, dense forests, dinky copses, rolling hills, majestic fallow deer and burrowing rabbits. Covering almost 2500 acres, Richmond Park is the largest Royal Park in London. With such a large space it's hard to know where to start when visiting. A tall brick wall surrounds the entire park so you need to first work out which gate you are going to use to enter and then plan your route from there. The best way to enter is via Richmond Gate, heading first for King Henry's Mound. The park's position on the edge of town affords it some fantastic panoramas of the capital - King Henry VIII's Mound is the place to head for uninterrupted views all the way to St Paul's Cathedral. Wherever you chose to roam - via the ponds and Deer Park or circumventing the many lodges, make sure you end up at the Isabella Plantation. Heavily wooded and wholly organic, the Isabella Plantation bursts with massive mounds of azaleas, rhododendrons, camellias and magnolias and really is truly magical. Apart from a couple of roads running around the edge of the park (traffic is highly regulated and, for the most part, unassuming) the park has changed little since the reign of Charles I. Responsible for park's enclosure and the introduction of deer, Charles I sought sanctuary in Richmond during the plague. These days the park performs much the same function, offering a calming sanctuary from the pressures of city life. Enjoy. Just north of the celebrated royal palace at Hampton Court, Bushy Park is the second largest of the Royal Parks. On the surface, the park appears simply to be a vast, rural expanse of exceptional wild beauty but of little historical significance. The lush grass, wooded copses and winding rivers do, however, hide an interesting past. A settlement for over 4,000 years, a number of interesting items have been extracted from the park - archaeologists unearthed a Bronze Age burial mound and barrow here, the contents of which now reside in the British Museum. A keen eye for detail can make out the traces of medieval field boundaries, in existence before Henry VIII turned the area into one huge deer-hunting ground. The park was used more recently during both World Wars, as agricultural land when Britain was suffering food shortages and as the Supreme Headquarters of the Allied Expeditionary Force. The Longford River looks perfectly at ease in its surroundings, flowing leisurely through the park, but it is in truth a 13 mile artificial waterway, built in the time of Charles I to divert water from the River Colne to Hampton Court. History aside, these days Bushy Park is simply a wonderful place to get outside, walk away an afternoon and watch the sun slide spectacularly behind the horizon. The parks most notable feature is Chestnut Avenue; the mile long thoroughfare designed by Sir Christopher Wren is flanked on either side by majestic rows of horse chestnut trees and leads to the majestic Diana Fountain. Anglers can try their luck in the three ponds and there are facilities for a host of other sports including rugby, football, horse-riding and hockey. Formal plantations of trees mingle with wildlife conservation areas and big mounds of bracken hiding herds of deer. Combine a walk in the park with a visit to Hampton Court. Leave the palace by the Lion Gate, stop off for a refreshing pint in the Kings Arms pub just outside before you cross the road and enter the park via the Hampton Court Gate. Walk towards Hampton Wick and take the train back from there. Hampstead Heath has fields to run in, long grass to roll in, woods to hide in and, most famously, ponds to swim in. In north London this is THE place to get back to nature. Strewn with picnickers, cyclists, families and the rest, the heath is large enough and has enough copses, hills and mounds that a quiet spot is never far away. 'Chronicles of Narnia' author, CS Lewis, lived near Hampstead Heath and local folklore asserts that it was its picturesque rises, ponds and woodland glades which inspired his mystical land. Parliament Hill is a beacon in the midst of this sprawling expanse of natural beauty. Its summit provides a view of the city almost in its entirety. Spot the famous dome of St Paul's juxtaposed by the ultra-modern Canary Wharf Tower in the distance. This is the perfect kite-flying spot. Hampstead Heath is renowned as a rich conservation area and parts of it are designated as areas of scientific interest by English Nature. Hoards flock to the refreshing waters of the Heath's celebrated ponds in the summer months whilst in the colder months it's more rewarding to while away an afternoon feeding the ducks or exploring the lush woodland, bogs, hedgerows and grassland. Along the edges of the heath a number of attractions will attempt to lure you away. There's the lido at the south, Kenwood House at the north, South End Green and Hampstead Village at the west, and Highgate to the east. There are also plenty of pubs dotted around the edge - the Spaniards Inn (Spaniards Road), the Holly Bush (22 Holly Mount) or the Freemason's Arms (32 Downshire Hill) are all worthy of a visit. The heath doesn't look quite as rural as when Constable painted it, but nonetheless, it is as close to rural as you're going to get in a capital city. Another of London's spectacular John Nash creations, Regent's Park is a huge, thriving green expanse in the heart of the capital. Consisting of two circular areas (an Inner and Outer Circle) the park is bordered by stunning, stark white stucco terraced houses - also designed by royal architect, Nash. At one-time a hunting ground for the ever-ebullient Henry VIII, the Prince Regent (later King George IV) commissioned Nash to transform the land in the early 19th century. Now most famously associated with London Zoo - positioned over on the north-east corner of the park - an open-air theatre, ornate bandstand, large boating lake, huge mosque and 100-acre sports field add to its many attractions. The rest of its 410 acres consist of vast open parkland interspersed with formal, landscaped gardens. Dating back to the 1930s, Queen Mary's Gardens are still regularly and fastidiously tended, while the Rose Garden now bursts at the seams with over 30,000 flowers. Primrose Hill lies at the north of Regent's Park, merging and rising to a peak to offer fantastic views over Westminster and the City. A number of pretty eateries populate Regent's Park, while Primrose Hill is heaving with trendy cafes and bars. This is a great place for almost every kind of outdoor pursuit. If you're visiting the zoo or theatre, make sure you schedule in a couple of hours to explore this elegant, rural recreation area. Primrose Hill has become increasingly popular with the young, the trendy and the famous - particularly from the media world but don't let this put you off. It's a great place to stroll through and take in the scenery. Having climbed the steep slopes and admired the panorama you can regain your strength in one of the many cosy cafés, restaurants or pubs nearby. One of the most pleasant ways to approach the park is to get off at Camden Town and walk along the canal. Remember to keep your eyes peeled for celebs. Technically two different parks, Hyde Park and Kensington Gardens are in practical terms one huge, merging expanse. The 'split' dates back to 1728 when Queen Caroline, wife of George II, took almost 300 acres from Hyde Park to form Kensington Gardens. 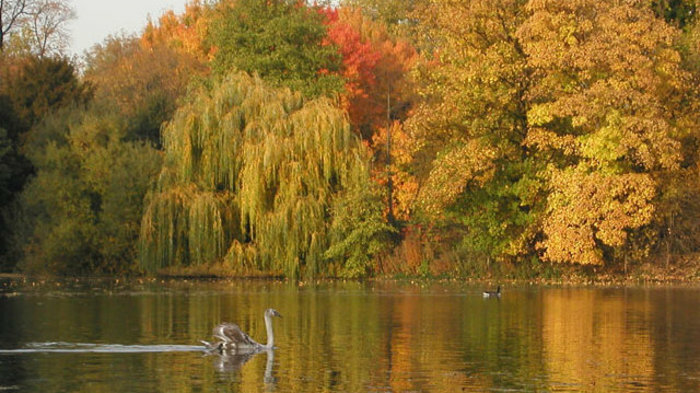 The 350 acres that remained has become one of London's best-loved parks. Almost every kind of outdoor pursuit takes place within its lush green landscape. Horse riding, rollerblading, bowls, putting and tennis are all catered for while informal games of cricket, rounders and frizbee spring up on the area to the south of the park known as The Sports Field. A number of famous London attractions are also housed within this central space. Hyde Park boasts Speakers' Corner, the Princess of Wales Memorial Fountain and the Serpentine Boating Lake - another feature owed to Queen Caroline who started a new landscaping trend by designing this natural-looking lake. Today the water is a hive of activity in the summer months, doubling up as a lido and boating lake with its very own solar powered boat plus two cafes - The Lido Cafe and Serpentine Bar & Kitchen - on the water's edge. Hyde Park's central location means it attracts a diverse crowd, making it one of the most buzzing, fun green spaces in London. A full diary of events including free guided walks, concerts and children's entertainment complete the picture. One of London's best kept secrets, Victoria Park is a fantastic place to spend an afternoon. Inside the park's boundaries countless varieties of trees stripe the skyline: oaks, horse chestnuts, cherries, hawthorns and even Kentucky coffee trees. The park is split in two by Grove Road. The smaller, western section contains the most picturesque of its lakes with a fully functioning fountain and the imposing Dogs of Alcibiades, two snarling sculptures. Retreat to the quiet of the Old English Garden, a floral haven brimming with flowers and shrubs. Have a peek into the deer enclosure and let the kids run off some energy in the children's playground. The city's first public park, Victoria Park was opened in the East End in 1845 after a local MP presented Queen Victoria with a petition of 30,000 signatures. It was envisaged as a Regent's Park of the east and originally had its own Speaker's Corner. The Victorians saw parks as instruments of moral and physical improvement, especially for the working classes. Sanitary reformer William Farr believed the use of parks would significantly boost life expectancy. Why not boost your constitution and have an enjoyable day out at the same time, as you explore the many attractions of this glorious park. 200-acre riverside park opposite Chelsea. Situated on the south side of the Thames, facing Chelsea, Battersea Park caters for everyone within its 200-acre space. Firstly, there's lots of water - a lake for boating, ponds for admiring the wildlife, and the Thames along one side for general gazing purposes. Then there's art - the Pumphouse Gallery has regular exhibitions and there are many sculptures dotted around the park itself. Next comes sport - with all-weather pitches, tennis courts and a place to hire bicycles there's no excuse to be lazy. Children get a great deal with their own adventure playground and zoo, while a majestic Peace Pagoda bestows an air of calm and tranquillity to the typically action-packed surroundings. Wildlife thrives here with birds, animals and plants happily cohabiting within the grounds. Perhaps one of London's loveliest leafy expanses, Brockwell Park has become a Mecca for fun-loving kiddies. Often termed "Brixton's Beach", the park is remarkable for its large lido, now one of the few remaining outdoor swimming pools in London. It is an ideal place to take a dip in the summer and catch some rays. There is also a safe paddling pool for the smaller tots to splash around in. In 2003, a meticulously built miniature railway was opened. Kids can jump aboard and explore the park for just £1. Both this and the lido are only open in summer months. There are also six public tennis courts. Brockwell Hall is a handsome Regency lodge occupying the park heights. Many a scone can be consumed here in the delightful tea-room. The shaded arbour in the English walled garden is also a blissful place to catch your breath and watch the world go by. Much of London was once entirely covered by the ancient Forest of Middlesex. The oak, holly, and hornbeam trees of Highgate Woods and Queen's Wood (a road is all that separates the two), alongside a few other patches of green across the city, are the only proof it ever existed. 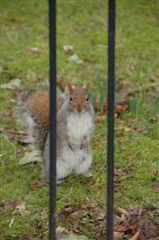 Seven species of bats, foxes, grey squirrels and over 70 species of birds still happily inhabit this 70-acre patch, which has been cared for by the Corporation of London since the Lord Mayor pronounced it "an open space forever" in 1886. A year-round attraction, bluebells carpet the floor in the spring, picnickers in the summer, russet leaves in the autumn and snowdrops in the winter. A walk around Highgate Woods is a fantastic way to escape the hubbub of the city, its cooling glades offer escape from the sun on hot days and shelter on cool afternoons. When night falls you can join one of the organised Bat Walks. These are extremely popular so pre-booking is essential. For information leaflets and trail guides visit the information centre located in the middle of the woods near the cricket pitch. A great way to end your visit is by popping into the charming Pavilion Café to sample a home-cooked meal made from fresh local produce. Its outdoor garden, surrounded by plants, flowers and tiny lights is the perfect way to see out the day. St James's Park, along with Kensington Palace. The park borders St James's Palace and Buckingham Palace, which means that as well as offering lush peacefulness you're also treated to stunning close-ups of some of the capital's most iconic attractions. One of the park's best views can be had from the middle of the Blue Bridge which spans the park's lake. Stand in the middle and take in the graceful arc of the London Eye, which looms over Duck Island. A true retreat, it's hard to believe that St James's was once a swampy watermeadow in centuries past. Now, rolling lawns stretch out around the lake, which is home to ducks, geese and pelicans. In the summer months visitors can catch a concert, loll in deckchairs or dine alfresco with a picnic or on the terrace of the park's restaurant. At only 54 acres its perfect for an intimate picnic or romantic stroll. Pretty, petit Holland Park is the ideal location for those wanting to escape the clamour of the city but who don't want to travel too far out of the centre. Tucked away in one of London's most elegant districts, the park offers small, cosy grassy knolls, cooling woodland glades, wild ponds, pavilions, an open expanse for games and general frolicking, playgrounds for older and younger children and a caf. Small, but perfectly formed, this lovely park is perfect for an intimate picnic or romantic stroll. There are beautiful woodland trails, manicured lawns and formal gardens, the Kyoto Japanese Garden with its resident Coi, and a fantastic ice cream stand in the middle. Holland Park used to be a private estate belonging to the Earl of Holland and during the 19th century the house attracted high profile visitors from various walks of life from the politician Lord Palmerston to the poet Lord Byron. The former ballroom of Holland House is now the stylish Belvedere restaurant, while the Orangery and Ice House host temporary exhibitions. In the summer open-air operas are performed at the park's theatre. Look out for peacocks roaming around. One of our favourites, this beautiful park occupies a dramatic sloping site overlooking the city and was given to Londoners by Sir Sidney Waterlow as a 'garden for the gardenless'. Retaining a secret garden charm with tree-lined walkways and ponds on different levels, it's one of London's finest landscaped parks. It's amazing to think they managed to fit some tennis courts into Waterlow Park but it's a lovely spot for a game. The six immaculately kept courts have been attractively built into the hill. Take a picnic, play a set or two then catch a few rays in the park after. It's absolutely idyllic. If Wimbledon Common is too vast and bleak for you, head for nearby Cannizaro Park. This Grade II* listed garden covers 35 acres and is located of the west side of Wimbledon Common, a few minutes walk from the Village. Adjacent to Cannizaro House Hotel but no longer connected to it, it is a fine example of the style of large garden common to London mansions in the 19th century and is bewitchingly timeless. Small and sheltered, the park bursts into colour in summertime. A labyrinth of paths interweave across the gardens while the lush stretch of lawn is very suited to civilised picnicking. The park is also known for its open-air theatre, comprising a stage and 700 seat auditorium. Watch out for the jazz festivals every summer, you can lie back and listen to the blues floating through the trees. In the last two weeks of July, the Italian Garden is the venue for the annual festival including music, comedy and live performances. This area is part of the Old Kitchen Garden which was divided into two sections - the upper lawns area and the Italian Garden itself - in the late 1980s. North of this area are the Keir Garden and Maple Avenue, while south are the Water Garden, Lady Jane's Wood, Azalea Dell, Mediterranean Garden, Belvedere, and Retreat, which stretches around towards the Crooked Billet. Today's 34-acre Cannizaro Park owes some of its best features to former residents of the big house: Henry Dundas Viscount Melville, Home Secretary and First Lord of the Admiralty under Prime Minister William Pitt the Younger; and to Mr and Mrs E Kenneth Wilson who lived there from 1920 to 1947. Although Sir Joseph Paxton's Crystal Palace - first erected in Hyde Park for the Great Exhibition of 1851 and moved here a couple of years later - was destroyed by fire in 1936, Crystal Palace Park and its beautifully landscaped 200 acres remain to be enjoyed. This outer-London park, easily reached by Overground to Crystal Palace, has great views, lots of space and plenty to entertain all ages: London's largest maze, a lakeside concert platform, fishing, a children's playground, the Crystal Palace Park Farm, and the famous life-size dinosaur sculptures - created in 1852 by Benjamin Waterhouse-Hawkins and Professor Richard Owen, founder of London's Natural History Museum and the inventor of the word 'dinosaur'. At the centre of the park is the National Sports Centre, which hosts international athletics meetings as well as housing facilities anyone can use, such as swimming and diving pools, a climbing wall and beach volleyball courts. And if you're feeling peckish, try family-friendly café Brown & Green, right beside the station. Look out for regular events such as vintage car rallies, live concerts, funfairs and colourful firework displays. A magnificent makeover and a great place to get active. Southwark's largest park, Burgess Park, is at the heart of the borough, stretching all the way across from Walworth to the Old Kent Road. It was originally created from a bombsite after the Bliz; a multimillion-pound facelift in 2012 has given it a new lease of life with a funky adventure playground, play fountains, go-karting, and the Burgess Park BMX Track. Sports facilities include football pitches, cricket pitches and tennis courts. Recent landscaping has created rolling hills and sunken gardens, while making the most of existing features such as the fishing lake and historic industrial remains. It's a great place for walking, running, rollerblading and cycling, with paths along the old canal (now filled in) carrying on all the way down to Peckham. From cheap budget accommodation to luxury 5 star suites see our deals for hotels, including Holiday Inn London - Stratford City from 73% off.